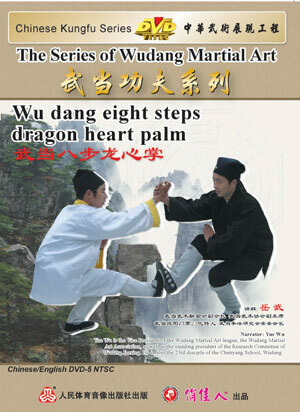 Wudang 8-step Dragon Heart Palm is the one and the only one represented method of all the Wudang martial skill factions. It belongs to Wudang Pure Positive faction. It is taught by monk Liu Li-hang, the great master of Wudang. It is usually use in smelt elixir and practice Taosim, preserve one’s health and protect oneself. When practice, step by step, interchange Positive and Negative; like dragon swims in the foggy sea, in a supernatural being way, like a great master, separate the eight diagrams in five Elements, move lightness like a swallow skate over the surface of water, like ape jump. Follow your inclinations like walk on the flat, the pace and courses are follow the Taiji diagram, yin and yang diagram, eight diagrams, and five elements diagram, especially fit for the Taiji principium. The capture are elegant and fairness, free from vulgarity. Practicing this action makes you comfortable and relax, build the strength while take the move, fill the lower part of the abdomen with strength and sent it to every part of you and this is the purpose of this action. And this will also have the effect of improve your attack skill and preserve your health.